Whomever did this is a genius. "Libanka wa nastamer" (to remain and continue) was for a long time the official selling line of the Lebanese Forces as a "guarantor" for the Christians' presence in the region. 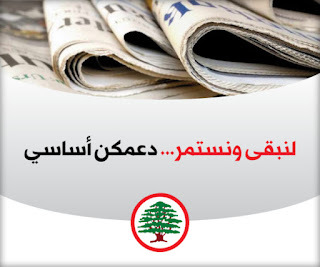 So with the Lebanese Forces launching a fundraising campaign online using this slogan to describe the party itself and its existence is a wonderful act of branding, but also a reminiscent of what used to be (and still is). No other slogan ticks that many boxes with the target audience.